Now that your app is live, you’ve probably considered using push notifications and their potential value in your marketing strategy for your app. Studies show that 68% of app users enable push notifications for the apps they download and 70% of them say those notifications are valuable. When would they want to receive notifications? Where is your user base located? In this article we’ll go over how to address these questions. As with any type of communication, it’s important to understand who your audience is and what they’re likely to respond to. There’s no point sending out push notifications about a sale on hamburgers to vegans. While that’s a slightly extreme example of what you need to look out for, many marketers do miss the boat when effectively communicating their sales and offers via push notifications for similar reasons. The key thing to understand is what your audience is interested in hearing about and why they’ve downloaded your app. If your company provides a news or an informational service, then sending out notifications relative to specific news events will likely prove valuable. For example, a traffic app that alerts users to accidents or road hazards will benefit the end user and help build brand reputation. Understand the audience benefit of our app and ensure you’re maximizing this via your notifications. The second critical element you need to keep in mind when sending out push notifications is what time is best to reach your audience. Notifications sent at 3 AM will either largely go unnoticed or annoy your audience and possibly lead to your app being deleted. Within your push notification settings, you can set scheduled start dates for your messaging and establish send times relative to the local time zones of your users. You also need to consider when your messages are likely to see the best response – if your audience is primarily stay-at-home moms, your optimum send time is going to be vastly different than someone who’s targeting office workers. Do some research to understand when your audience is most likely to be active and/or most receptive to your notifications, and ensure you reach them when they want. Another factor to keep in mind is geo-targeting which can help ensure your messages get shared to the right audience. Doing this allows you to share your messages with audiences based on their geographic location. Although not everyone allows geo-tracking on their mobile device, many people do. This can prove extremely valuable in your push notification process. For example, if you’re marketing a restaurant and you want to reach users who’ve downloaded your app within a certain geographic radius of your eatery to notify them of a new deal or menu item, you can. Such capacity can be great for eateries who want to reach office workers during the lunch time rush. Be careful though, any more than a couple of notifications of this sort per week could risk over doing and lose you subscribers. Success can be defined by a fine line. Personalization may be the most valuable aspect of push notifications. When you’re communicating with someone via their mobile device, that’s a very personal thing. It’s a direct line of communication between you and them. With that perspective in mind, do you think sending people a generic notification is really the best way to cut through the other messages and updates they receive each day? People love to be treated with priority; they love being shown that they’re important and that you’re listening to them. Though this may seem beyond the capacity of a push notification – it’s not. Taking the time to add in a level of personalization can make a huge difference in your engagement and response rates. Personalization in this context is not necessarily about addressing people by their name. That’s often a big turn-off when it’s clearly an auto-generated message. What you should be focusing on is personalizing the content. Segmenting your app users with the data you have available, this way you can reach specific segments of your audience with messages relevant to them. When they click through, take them to the pages they visit most often and show them the deals most relevant to them. Someone who buys a lot of basketball gear is probably not going to be as interested in your special on golf shoes. 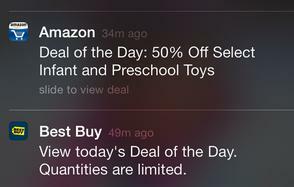 Amazon’s notification is personalized. It’s directed at customers based on their purchase history. Best Buy’s messaging is not – they send the same exact message to all users of their app. Which do you think is more engaging? A customer who’s just purchased a range of baby gear is probably more likely to click through on a deal for related baby equipment than someone being hit with yet another Best Buy ‘Deal of the Day’. It’s important to keep the customer’s utility of your app in mind and use the cues you have to focus your message – the more personally tuned-in the better. If you’re not utilizing the data available to you based on actions taken in response to your notifications, you’re doing it wrong. If you’re sending out the same message over and over again and getting the same poor response, that’s a pretty good sign you need to change your messaging. It’s important to understand that your audience does not need to see sales notifications three times a day. The most significant advantage of the connected era is data. The ability to track and correlate user activity and actions is an amazing opportunity that allows you to use that data to better focus and refine your process when sending out notifications. Not only does this help you to optimize your results, but it can also give you additional insights as user’s interaction increases. Test different types of messaging at different times of day and find out what works best for your audience. Generic guides are great to get you thinking and show you what’s possible, but it’s up to you to figure out what works best for your audience. Monitor what’s working for others and remember the only true rule is to remember what your audience wants. Your unique specific group of customers may use their apps differently to others. There may be quirks that you’ll only find out through listening and experimentation. The only way you can accurately trace such instances is through your analytics. Examine what works, improve where you can and refine often. There’s lots of opportunities in push notifications and the direct connection with your audience which can help you to maximize the usage of your app while also helping build your brand and expand the reach of your messaging. The most important thing to keep in mind is that push notifications are about what your audience wants to hear and not necessarily what you want to tell them. Keep that in mind and you’ll be on your way to maximizing your success! Want more tips on marketing your app? Check out the BuildFire blog!